During cold and rainy weather, the last thing you want to be worried about is your furnace not functioning properly. For this reason, furnace maintenance and repairs are one of the most important actions you can take for your home. 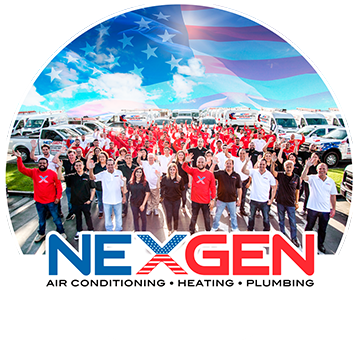 Scheduling regular maintenance, inspections, and repairs with a reputable HVAC company in your area such as NexGen, will help prevent furnace problems. Lack of maintenance: If you don’t schedule regular furnace inspections and maintenance, you may be in for an unexpected breakdown just when you need your furnace most. Maintenance is extremely important to help your furnace run as well as it should, and heat your home when you need it. Dirty filters: Dirty or clogged filters are one of the most common problems for furnace owners. They can reduce airflow and put more strain on the furnace. In extreme cases, filters clogged with dirt and debris can damage the limit switch, which controls the fan, and result in even more problems. Daily wear and tear: Just like any appliance, constant use will age the appliance quickly and it may malfunction. This is another reason to make sure your furnace is well taken care of by a company like NexGen who makes sure your home is protected and comfortable at all times. Most furnaces last about fifteen years before they need to be replaced. Electric ignition or pilot control problems: If your furnace isn’t lighting, it can’t heat your home. When you notice the pilot light is out, you will want to call your HVAC technician to have the problem professionally fixed. Malfunctioning thermostats: If your thermostat is not working correctly, this could lead to your heater or ac not turning on at the times you have programmed it to. Furnace not heating enough: If your furnace doesn’t keep your house warm enough on a consistent basis, you may have a furnace that is simply too small for your space. An appointment to have a technician inspect your homes HVAC system will help determine what type of furnace your home needs. Frequent on-and-off cycling: Clogged filters may cause the thermostat and fan to cycle on and off repeatedly, even when the house is not finished heating or is warm enough. Improper airflow may also be the culprit. Noisy furnace: Rumbling, squeaking, and rattling sounds coming from your furnace may indicate a problem, blockage, or airflow reduction that needs to be investigated by a professional HVAC company. Blower never turns off: If your blower never seems to turn off, the limit switch may need professional replacement. All of these issues can be solved quickly and easily through regular HVAC system maintenance and the help of NexGen professional HVAC advisers. If you are having an HVAC emergency, call NexGen today at 833-3NEXGEN!